If students are found to have lice on their scalp the parents will be notified and the student will be dismissed until infestation is properly treated. It is expected that the student will be treated at home that day with a medicated shampoo or lotion. Upon returning to school the next day, the parent must accompany the student to the clinic to be checked again for lice. 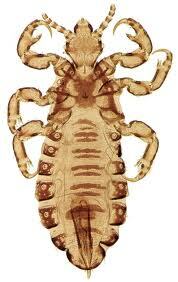 If the student has live lice they will be excluded from school until they have received adequate treatment. Classroom checks will no longer be preformed. By the time a child with an active lice infestation has been identified, he or she may have had the infestation for one month or more, and therefore poses little additional risk of transmission to others. 1). Shampoo hair with medicated shampoo or lotion lice treatment. 5). Hair accessories, helmets, headphones, stuffed animals can either be placed in a sealed plastic back and place in the freezer overnight or leave sealed for 14 days. 6). Check other members of family and treat if infestation is present.